What did popular song mean to people across the world during the First World War? For the first time, song repertoires and musical industries from countries on both sides in the Great War as well as from neutral countries are analysed in one exciting volume. Experts from around the world, and with very different approaches, bring to life the entertainment of a century ago, to show the role it played in the lives of our ancestors. The reader will meet with the penniless lyricist, the theatre chain owner, the cross-dressing singer, fado composer, stage Scotsman or rhyming soldier, whether they come from Serbia, Britain, the USA, Germany, France, Portugal or elsewhere, in this fascinating exploration of showbiz before the generalization of the gramophone. Singing was a vector for patriotic support for the war, and sometimes for anti-war activism, but it was much more than that, and expressed and constructed debates, anxieties, social identities and changes in gender roles. 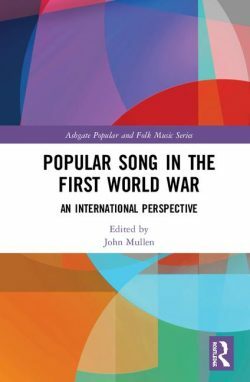 This work, accompanied by many links to online recordings, will allow the reader to glimpse the complex role of popular song in people’s lives in a period of total war. Chapter XII Popular music and eroticism: the Spanish Cuplé during the years of the First World War Lidia López.